UNITED NATIONS, February 1 -- One month now into 2007, and into the term of new UN Secretary General Ban Ki-moon, on most counts access to information is not what it should be. Ban Ki-moon posted his financial disclosure and that's all to the good -- although as many have noted, since he made these disclosures while a South Korean diplomat, it wasn't such a stretch. The proof may be whether any other senior officials in the Ban Ki-moon administration make disclosures. Despite Mr. Ban's seeming call for transparency at the UN, including its funds and programs, a sample fund, UNFPA, has gone to absurd lengths not to answer questions. The agency -- full name UN Population Fund -- promised through its spokesman to provide answers on January 22 to questions about its spending in North Korea. Then the spokesman Abubakar Dungus decided to go missing. 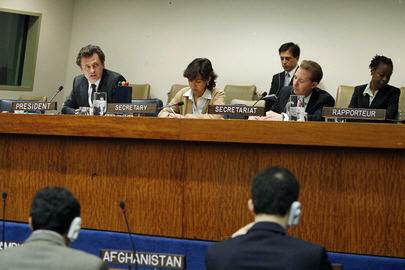 He claimed to be out of the office until January 25, despite being seen in UN headquarters in this time. Now a full week later there has still been no response. Mr. Dungus and his boss, Ms. Cagar, have both been emailed reminders. Inner City Press: Could you say which Funds and Programs the Deputy Secretary-General is going to visit? Are you going to put out her schedule? Spokesperson: She is going first to start meeting the staff in Headquarters. Then she is going to go on. This is not a process that is going to end next week, it is a continuing process. It is normal that she meets the staff. Inner City Press: Under the previous administration, they would also put out the Secretary-General�s schedule and also the Deputy Secretary-General�s. Spokesperson: The schedule of the Deputy Secretary-General will be put out also, but starting next week. Inner City Press: Eleven days ago we asked UNFPA to describe programmes in the Democratic People�s Republic of Korea. Their Spokesman said that they would do ten days ago, and they have not provided anything. We have got the internal audit, and so we now know what it is. But I am wondering whether, speaking for Ban Ki-moon or the Secretariat, whether in the sake of transparency, if you think it is appropriate that a fund or program of the United Nations declines to provide any information for 11 days? Spokesperson: Well, you should ask them once more. Inner City Press: I have asked them, yesterday. So I guess, maybe I am asking you to give some guidance. I know that these programs and funds and agencies are separate, but I think it ends up reflecting on � if he wants to bring transparency, a place to start would be with the funds, programs and agencies. This UN-prepared transcript is less than accurate (click here for video), but the upshot is that, when presented with the case of a UN fund dodging questions for more than ten days, Ban Ki-moon's spokesperson, far from providing guidance on transparency, reflexively defended the stonewall, adopting a line from her predessessor (this is more clear in the audio-video clip, click here to view and see). Also on Thursday, the UN Development Program tried to limit access by even the UN-accredited to a briefing by its Administrator, the elusive Kemal Dervis. Click here for that story. While persistence resulted in opening up the meeting and letting the sunshine in, when a colleague reporter suggested telling the office of Ban Ki-moon's spokesperson to get access, the answer was not at all clear. But it should be, and soon. Lack of transparency at UN funds and programs reflects back on the Secretary General. A decision will need to be made what to do about lawless and unaccountable behavior at the little fiefdoms that exist, right across First Avenue and on 42nd Street by Grand Central. If Ban Ki-moon does not crack this sleazy cloak now, if it doubtful he will do so later. 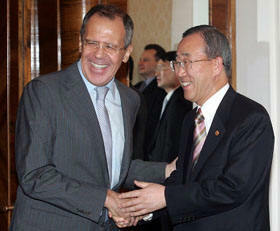 Ban Ki-moon and Sergei Lavrov: if January was any guide, was this a pact of secrecy? Inner City Press: In the last news-cycle, one of the President Al-Bashir�s advisors has been quoted as saying that the US wants regime change in Sudan and is using the international community and NGOs to bring that about. Has there been any response from the UN to that statement? There is another statement, saying that the International Criminal Court is entirely not needed in Darfur. Spokesperson: As I said, we don�t have reactions to press statements or things relayed by the press. Inner City Press: Jan Pronk is out. Is the Secretary-General going to appoint a new Special Representative for Sudan? Inner City Press: As part of the restructuring, or faster than that? Spokesperson: I don�t know at this point. This can and should be distinguished from access to information. Rather, it concerns Ban Ki-moon's administration's willingness and ability to respond in real-time to such charges as that they are pawns of a Permanent Five member of the Council. If Jan Pronk were in place, he would respond in his blog. When will Pronk be replaced? Everything's on hold. At the end of Russia's month at the head of the Security Council, it must be said that very little happened. Apparently by design, the Russian Federation had a light Council schedule, and said little at the stakeout. Despite a seeming Africa focus in the agenda, when asked if the Chad and Central African Republic meeting portended any help to northwest CAR, Amb. Churkin erroneously said yes. (Click here for the CAR alarm story.) "I'm not going to comment on that," was said again and again by Vitaly Churkin. As simply another example, did China stall the renewal of the UN's mission in Haiti due to issues of Taiwan? "It didn't come up in the Council," was Amb. Churkin's standard answer. But other P-5 diplomats confirmed that this was indeed the issue, and it has since been reported, by Sankei's always-intrepid Abigail Somma, that Haitian president Preval sent an envoy to New York, to meet with Chinese Ambassador Wong and figuratively kiss his ring. So why the secrecy? Perhaps it is missions' right. Wednesday's night at the Russian mission, the security was tight for what is the customary end-of-Presidency reception. Japan's Ambassador Kenzo Oshima, for example, when his month came to an end, raised several cups with the press corps. (Now it's said that, after Vietnam, Japan will get the next Asian group turn at the Council, instead of Mongolia. Food for thought, and for questions.) So too with Peru's Ambassador. At the Russian mission on 67th Street, there were metal detectors and detailed lists of invitees. Perhaps the presence of Foreign Minister Sergei Lavrov explained it. And inside as is so often the case in UN-world, some diplomatic hair was let down. But the candor came too late, after the month was over. We will report tomorrow on the Slovakian Ambassador's pitch. February is short, but it could not be more arid. Let the sunshine in, from the Council to the funds and programs to Ban Ki-moon's 38th floor. If not now, when? UNITED NATIONS, January 31 -- Within the UN's orbit there is a Working Group on the Crime of Aggression, whose current task is to provide a definition, for the International Criminal Court. Wednesday Inner City Press asked the Ambassador of Liechtenstein, Christian Wanaweser, whether in Somalia the acts of the Islamic Courts Union, the Ethiopian Army and the United States' aerial raid on southern Somalia would constitute aggression. He answered that it "depends if it can credibly be argued as self-defense, otherwise it would appear quite clear to fall under the definition" of aggression. Video here, from Minute 7:55. The definition will be limited to states -- "you have to have a government and a defined territory," Amb. Wanaweser said. The Islamic Courts Union to some degree had both. But the Transitional Federal Government, then in Baidoa and now installed in Mogadishu by Ethiopia's Army, is deemed the lawful government. And thus possibly an ICC defendant. And yet such status is not final. Inner City Press asked Amb. Wanaweser for his view on UN officials like Jan Egeland meeting with Joseph Kony and Vincent Otti, under indictment for war crimes with the Lord's Resistance Army. "It's a problem of perception," Amb. Wanaweser replied. Video here, from Minute 24:06. "It's the argument about peace versus justice. this is the starkest example, the one you have brought up. But I don't the two concepts are mutually exclusive." Many people say that; one voice which stands out is that of Richard Goldstone, who answered Inner City Press' question by saying that the Security Council is free to suspend the indictments for up to a year, but until that is done, there should be no meetings without attempted arrest. Amb. Wanaweser's press conference was more like a salon, in which he chatted with reporters who he called by first name, and answered with gestures that would not be caught on audio, not subject to quotation. For a small country, or principality, Liechtenstein is something of a UN player. In December 2006, Liechtenstein's penthouse apartment on 40th Street and Second Avenue was the venue of a surreal UN-world party, with open bar and view downward on the Secretariat building and UNDP. One wag jokes that the apartment was larger than Liechtenstein itself. Others more darkly questioned where the money comes from. On Wednesday Amb. Wanaweser asked rhetorically, "Eight million euros, is that a lot of money? I don't think so." In UN-world, everything is relative. At the noon briefing on Wednesday, it was said that only twenty of the fifty-eight officials asked to submit resignations have done so. Many reporters ran out of the room, saying this was the story of the day. Later the spokesperson said the twenty figure referred only to Under Secretaries General. Later still, it was said that of 55 asked to resign, all but two have. What happened to the previously stated 58? And who are the two? We'll see. Inner City Press asked for Ban Ki-moon's positions on Cote D'Ivoire, where Resolution 1721 is being left behind, and on the troop contribution shortfall for Somalia. On the first, a list of meetings is to be provided, with perhaps a statement to follow. On the second, the spokeswoman said to ask the African Union. But where's Lonseny Fall?